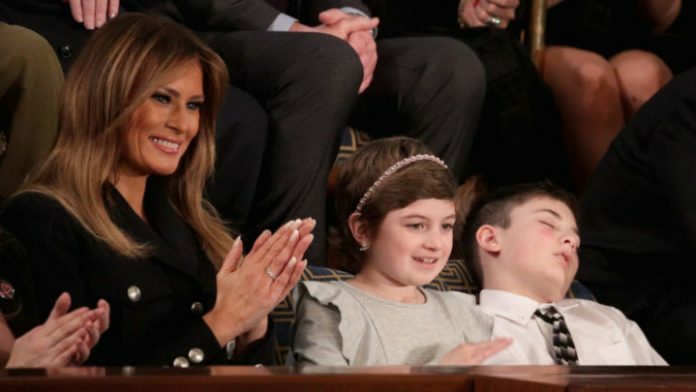 A young boy, who sports the same name as the US President, has become an unlikely “hero” by people around the world after he fell asleep during the State of the Union. Joshua Trump, who has been bullied at school for his surname, was invited to the event in Washington by the Trump’s after finding out about what he had been going through. While Donald Trump hoped to captivate audiences with his annual address, it unfortunately failed to entertain the 11-year-old who instead decided to have a nap. Looking very sharp in a white shirt and tie for the formal event, Joshua, who isn’t related to the president, struggled to keep his eyes open as Trump gave his one hour, 22 minutes and 21 second speech. Images of the young boy nodding off next to Melania Trump have been spread around the internet thanks to social media, with many hailing him a “hero”.